The often-misunderstood Fundamental Research Exemption (FRE) has a significant impact on university-based research and can result in inadvertent compliance gaps — especially when that research stems from a sponsored program. And in today’s political climate, as trade disputes and charges of IP misappropriation bring daily headlines and intense scrutiny, having your compliance efforts nailed down is more critical than ever before. Among other rules, in order for research to qualify as Fundamental Research, the research must be conducted free of any publication restrictions and without any access or dissemination restrictions. The Fundamental Research Exclusion will be lost if a researcher or research office agrees to allow sponsors to review and approve publications or to control access to the project or project results. 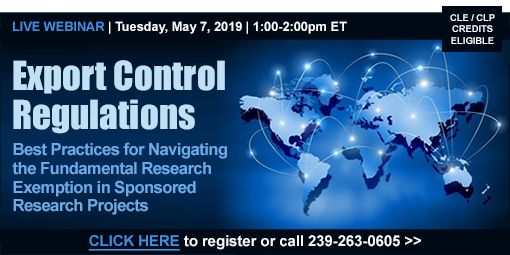 This one-hour distance learning program will define the fundamental research exemption and explain the framework around it within Export Administration Regulations (EAR) and the International Traffic in Arms Regulations (ITAR). Plus, get your questions answered during the live, interactive Q&A portion of the program! Kay Ellis, MHR, is Director of the Export Control Program at the University of Arizona. She provides export control training and has implemented campus-wide procedures to help ensure compliance with federal export control regulations. Prior to joining UA, she oversaw the export control programs at Oklahoma State University and the University of Texas at Austin. Ms. Ellis is a member and former Board Member of the Association of University Export Control Officers and the National Council of University Research Administrators. She has been a speaker at numerous professional conferences and webinars, authored for NCURA Magazine, and has co-authored export control training modules for the Collaborative Institutional Training Initiative Program. Participation in the live webinar is just $197 per site and allows access to one computer for an unlimited number of people to watch. Gather your entire staff and watch for maximum benefit!